Welcome to the Lego Jurassic World Amber Bricks locations guide that helps you find the total of 20 Amber Bricks locations / 20 playable dinosaur unlocks for the PS3, PS4, Xbox 360, Xbox One, Wii U, PC, 3DS & PS Vita action-adventure game. Take a look at some Amber Brick locations. Check below for all 20 Amber Bricks! The overview for all these in-game Amber Bricks locations, and exactly which dinosaur each one unlocks, is listed below. Protip: Go and find the “Amber Brick Detector” Red Brick first. It’ll make it a lot easier to locate the Amber Bricks when you’ve got an arrow pointing at them. How to find missing Amber Bricks? 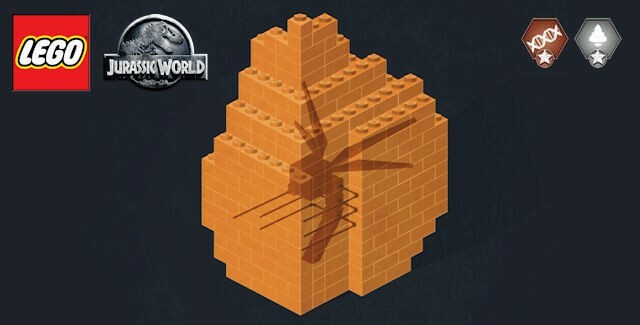 : In-game the Amber Bricks will appear simply as yellow, triangle-shaped bricks that look like they have something inside them (in fact, a mosquito’s with dino DNA is in them) that you can pick up to collect by walking/driving over it. It can be confirmed as being Amber Bricks by the on-screen counter confirming you’ve got the next out of 20 Amber Bricks in the game. Scroll down on this page for full instructions on how to get all Amber Bricks in Lego Jurassic World. Tip: By pressing start and going to the pause menu, you can see at the bottom of the menu screen how many collectibles you have found so far. • Finding each Story level’s Amber Brick unlocks that dinosaur for use in Free Play levels & in the HUB areas where ever you find the blue Dino Spawn Pads. • You’ll also be able to use that dino’s body parts / dinosaur DNA in the Dino Customizer from then on. Which can be found at the DNA Lab in the Visitor Center. That’s located on the top-left side of the left island (Isla Nublar from Jurassic Park) and a second one in the Jurassic World Innovation Center on the same island. Does the game save each Amber Bricks you collect? : Yes, the game will automatically save the Amber Bricks you just collected if you picked up the Amber Brick, so you don’t have to play to the end of the mission. After picking up each collectible you can safely quit the mission without losing collectibles progress. Warning: You should always select a ‘Save’ option from the pause menu before you stop playing the game or you’ll risk losing all you progress! Note: Sadly collecting the Amber Bricks won’t give you additional Gold Brick rewards. How to activate dino cheats? : In case you don’t feel like finding every Amber Brick in the game, you can use simple cheat codes too (listed below). To turn on cheat codes, you first have to be in-game. Next, during gameplay press pause. Like in every Lego game you can enter codes from the Main Menu by selecting “Extras” and then “Enter Code”. After which you can input the cheat to unlock dino’s quicker. Where to find all Amber Bricks in Lego Jurassic World? The in-game collectibles locations for the Amber Bricks are described in this detailed video guide by Trophygamer. The Amber Bricks are listed in the video in the order that they appear from Story level 1 to 20. • “Bingo! Dino DNA!” (20 Gamerscore / Bronze Trophy) — Collect an Amber Brick. • “The Legacy of John Hammond” (40 Gamerscore / Silver Trophy) — Collect All Amber Bricks. Description: This first Amber Brick contains “Gallimimus” DNA. Location: You will find this amber brick in “Level 1: Prologue” of Jurassic Park 1 on Isla Nublar. Which is the left island on the map; you enter the correct area by selecting the yellow Jurassic icon. – This will be the first story level you play in the game, before you can enter the open world areas. But you’ll have to revisit it in Free Play with access to more characters to get the Amber Brick. Travel to “The Dig Site” section of Level 1. It’s in the Dig Site’s dark cave. Use a character that can lit a light in the darkness — like Ian Malcolm’s flare or Timmy Murphy’s night vision goggles — to walk in and find the Amber Brick in the back of the cave. Cheat Code: The code to enter to get this Amber Brick’s dinosaur is ? Where exactly to find the Gallimimus Amber Brick: It’s shown in this video guide with voice-over directions that lead to the amber brick. Description: This second Amber Brick contains “Triceratops” DNA. Location: You will find this amber brick in “Level 2: Welcome To Jurassic Park” of Jurassic Park 1 on Isla Nublar. Which is the left island on the map; you enter the correct area by selecting the yellow Jurassic icon. Travel to the “Triceratops Recovery” section of Level 2. Here the Amber Brick is automatically received, there’s no way to avoid it. Where exactly to find the Triceratops Amber Brick: It’s shown in this video guide with voice-over tips that you always get this amber brick. Description: This third Amber Brick contains “Dilophosaurus” DNA. Location: You will find this amber brick in “Level 3: Park Shutdown” of Jurassic Park 1 on Isla Nublar. Which is the left island on the map; you enter the correct area by selecting the yellow Jurassic icon. Travel to the “T-Rex Chase” section of Level 3. First, throw 3 flares into the T-Rex’s mouth during the ending car chase, then switch to the driver and stick to the left side of the screen to drive over the Amber Brick. Where exactly to find the Dilophosaurus Amber Brick: It’s shown in this video guide with directions that lead to the amber brick. Description: This fourth Amber Brick contains “Velociraptor” DNA. Location: You will find this amber brick in “Level 4: Restoring Power” of Jurassic Park 1 on Isla Nublar. Which is the left island on the map; you enter the correct area by selecting the yellow Jurassic icon. Travel to the “Maintenance Shed” section of Level 4. During the security gate opening section, go to the maintenance shed to find a pile of dino poo, switch to Ellie Sattler to dive right in and find the Amber Brick. Cheat Code: The code to enter to get this Amber Brick’s dinosaur is “DDDFAC” (on 3DS) & “DAAADFR” (on PS Vita). Where exactly to find the Velociraptor Amber Brick: It’s shown in this video guide with useful directions that lead to the amber brick. Description: This fifth Amber Brick contains “Tyrannosaurus Rex” DNA. Location: You will find this amber brick in “Level 5: The Visitor Center” of Jurassic Park 1 on Isla Nublar. Which is the left island on the map; you enter the correct area by selecting the yellow Jurassic icon. Travel to the “Control Room” section of Level 5. Once you arrive in the Control Room, switch to the Lex Murphy character and use her glass-shattering scream ability to break the vending machine’s glass. Cheat Code: The code to enter to get this Amber Brick’s dinosaur is “CAAADT” (on 3DS) & “CAAADT” (on PS Vita). Where exactly to find the Tyrannosaurus Rex Amber Brick: It’s shown in this video guide with directions that lead to the amber brick. Description: This sixth Amber Brick contains “Stegosaurus” DNA. Location: You will find this amber brick in “Level 6: Isla Sorna” of Jurassic Park 2: The Lost World on Isla Sorna. Which is the right island on the map; you enter the correct area by selecting the red The Lost World icon. Cheat Code: The code to enter to get this Amber Brick’s dinosaur is “FAAAVT” (on 3DS) & “FAAAWTF” (on PS Vita). Where exactly to find the Stegosaurus Amber Brick: It’s shown in this video guide with directions that lead to the amber brick. Description: This seventh Amber Brick contains “Compsognathus” DNA. Location: You will find this amber brick in “Level 7: InGen Arrival” of Jurassic Park 2: The Lost World on Isla Sorna. Which is the right island on the map; you enter the correct area by selecting the red The Lost World icon. Travel to the “Mobile Lab” section of Level 7. During the sequence where the Mobile Lab is hanging off the side of the cliff, about to fall down, (after all falling objects have been avoided) switch from the rope-climbing Ian Malcolm to the sharpshooter/repairer Eddie Carr. After you use your tracking skill to find the Mobile Lab’s connection point, connect the tow-cable of a Jurassic Park jeep to the Mobile Lab and drive the jeep backwards to pull the Mobile Lab to safety. All normal story progression so far, but now as Eddie jump on the Mobile Lab’s side-stairs (above the left front-wheel) until you’re on top of the vehicle to find the Amber Brick sitting there. Cheat Code: The code to enter to get this Amber Brick’s dinosaur is “KAAAWV” (on 3DS) & “KAAAWAA” (on PS Vita). Where exactly to find the Compsognathus Amber Brick: It’s shown in this video guide with directions that lead to the amber brick. Description: This eighth Amber Brick contains “Parasaurolophus” DNA. Location: You will find this amber brick in “Level 8: The Hunted” of Jurassic Park 2: The Lost World on Isla Sorna. Which is the right island on the map; you enter the correct area by selecting the red The Lost World icon. Travel to “The Long Grass” section of Level 8. Along the route, you run into 5 InGen hunters being attacked by Velociraptors. Do the following to save all 5 and you’ll earn an Amber Brick that unlocks the Parasaurolophus. The 1st InGen hunter is trying to crawl out of the grass near where you start, pull him out to save him! You must rescue the other 4 InGen hunters in order to progress in the story level, meaning you must take a flash photo to drive away the Velociraptor from each hunter. Where exactly to find the Parasaurolophus Amber Brick: It’s shown in this video guide with directions that lead to the amber brick. Description: This ninth Amber Brick contains “Apatosaurus” DNA. Location: You will find this amber brick in “Level 9: Communications Center” of Jurassic Park 2: The Lost World on Isla Sorna. Which is the right island on the map; you enter the correct area by selecting the red The Lost World icon. – Play it in Free Play. Travel to the “Compound” section of Level 9. Switch to a Velociraptor dino to use its smelling ability to track down the green/brown smoke trail from the gate to the garage door (look for the red “garage” neon sign). Then switch to Barry and destroy every Lego object in front of the garage door and rebuild the Lego remains on the ground into a blue-white diamond-shaped target for Barry to shoot with his electric rifle. After that’s been shot, a second target will appear on the red “garage” neon sign above the door (to the right of the first target) and you can shoot the second target to receive the Amber Brick. Where exactly to find the Apatosaurus Amber Brick: It’s shown in this video guide with voice-over directions that lead to the amber brick. Description: This tenth Amber Brick contains “Brachiosaurus” DNA. Location: You will find this amber brick in “Level 10: San Diego” of Jurassic Park 2: The Lost World on Isla Sorna. Which is the right island on the map; you enter the correct area by selecting the red The Lost World icon. Travel to “The San Diego Docks” section of Level 10. On the ship, after making your way through the cockpit and fighting the InGen Guards, you’ll see a big white “05” and “04” letter painted on the outside deck floor. When you reach the “04” walk straight into the back to find an open container shrouded in darkness. Normal characters are scared of the dark, so you can only walk into it to pick up the Amber Brick in the back of the container through this darkness, by lighting a flare as any Ian Malcolm character or when using Timmy Murphy’s night vision goggles. Where exactly to find the Brachiosaurus Amber Brick: It’s shown in this video guide with directions that lead to the amber brick. Description: This eleventh Amber Brick contains “Corythosaurus” DNA. Location: You will find this amber brick in “Level 11: Landing Site” of Jurassic Park 3 on Isla Sorna. Which is the right island on the map; you enter the correct area by selecting the red Jurassic icon (not The Lost World icon). Travel to “The Landing Site Strip” section of Level 11. At the Landing Site you’ll see an antenna tower near the airplane strip (it’s next to the big stairs you can build). Look up at the antenna tower to see the Amber Brick floating near it (in between tree branches). The only way to reach it is by jumping to it via the antenna tower’s light blue/pink colored agility jump-pad, for which you’ll need a female character that have better agility than men. For example: Switch to Lex Murphy (Survivor) to reach the Amber Brick. Alternatively, at the Landing Site you can build the big stairs from Lego pieces you get from destroying everything around the antenna tower. Then switch to Billy Brennan with his gliding ability, and jump off the top of the big stairs and glide towards the Amber Brick using Billy’s parachute! Where exactly to find the Corythosaurus Amber Brick: It’s shown in this video guide with voice-over directions that lead to the amber brick. Description: This twelfth Amber Brick contains “Baryonyx” DNA. Location: You will find this amber brick in “Level 12: The Spinosaurus” of Jurassic Park 3 on Isla Sorna. Which is the right island on the map; you enter the correct area by selecting the red Jurassic icon (not The Lost World icon). Travel to “The Crash Site” section of Level 12. If you use Ellie to dig in the pile of poo, she will pull out blocks to build a Velociraptor launch point by the Amber Brick, enabling you to get the Amber Brick very easily instead of trying to jump on the dinosaur. Where exactly to find the Baryonyx Amber Brick: It’s shown in this video guide with voice-over directions that lead to the amber brick. Description: This thirteenth Amber Brick contains “Troodon” DNA. Location: You will find this amber brick in “Level 13: Breeding Facility” of Jurassic Park 3 on Isla Sorna. Which is the right island on the map; you enter the correct area by selecting the red Jurassic icon (not The Lost World icon). Travel to the “Lab Interior” section of Level 13. Where exactly to find the Troodon Amber Brick: It’s shown in this video guide with voice-over directions that lead to the amber brick. Description: This fourteenth Amber Brick contains “Pteranodon” DNA. Location: You will find this amber brick in “Level 14: Eric Kirby” of Jurassic Park 3 on Isla Sorna. Which is the right island on the map; you enter the correct area by selecting the red Jurassic icon (not The Lost World icon). – Play it in Free Play. Travel to “The Coast” section of Level 14. Just before the end of the level, there where you see the red and white arrows off to the left that indicate a parachute launch point for Billy Brennan. Change into Billy and sail-glide across the gap. Continue to the left to a fenced area, change into a female character to jump in (with her increased acrobatic ability), then turn into a Velociraptor to open the large shipping container; where the Amber Brick is inside. Where exactly to find the Pteranodon Amber Brick: It’s shown in this video guide with voice-over directions that lead to the amber brick. Description: This fifteenth Amber Brick contains “Spinosaurus” DNA. Location: You will find this amber brick in “Level 15: The Bird Cage” of Jurassic Park 3 on Isla Sorna. Which is the right island on the map; you enter the correct area by selecting the red Jurassic icon (not The Lost World icon). Travel to the “Pteranodon Nests” section of Level 15. If you notice next to the yellow crate there is a place where you can grow a plant. Switch to a character that can water plants like Ellie Sattler (Survivor) to make the green plant grow into a beautiful flower that you can jump on top of with any female character (they have acrobatic ability). Next, jump on this plant’s flower and use it as a trampoline to reach the top of the walkway (where the Amber Brick is hiding) easier than using a dino. Cheat Code: The code to enter to get this Amber Brick’s dinosaur is “MAAARF” (on 3DS) & “MAAARFS” (on PS Vita). Where exactly to find the Spinosaurus Amber Brick: It’s shown in this video guide with voice-over directions that lead to the amber brick. Description: This sixteenth Amber Brick contains “Pachycephalosaurus” DNA. Location: You will find this amber brick in “Level 16: Welcome To Jurassic World” of Jurassic World on Isla Nublar. Which is the left island on the map; you enter the correct area by selecting the blue Jurassic icon. Travel to the “Indominus Paddock” section of Level 16. Cheat Code: The code to enter to get this Amber Brick’s dinosaur is “IAAADT” (on 3DS) & “IAAATDR” (on PS Vita). Where exactly to find the Pachycephalosaurus Amber Brick: It’s shown at precisely 8:39 minutes into this video guide, with directions that lead to the amber brick. Description: This seventeenth Amber Brick contains “Ankylosaurus” DNA. Location: You will find this amber brick in “Level 17: Gyrosphere Valley” of Jurassic World on Isla Nublar. Which is the left island on the map; you enter the correct area by selecting the blue Jurassic icon. Travel to the “Gyrosphere Escape” section of Level 17. Towards the end of the chase with Indominus Rex, keep a Gyrosphere to the far left (in the background) to go up a slope and the Amber Brick will be at the top. Cheat Code: The code to enter to get this Amber Brick’s dinosaur is “PAAADT” (on 3DS) & “PAAADFD” (on PS Vita). Where exactly to find the Ankylosaurus Amber Brick: It’s shown in this video guide with voice-over directions that lead to the amber brick. Description: This eighteenth Amber Brick contains “Indominus Rex” DNA. Location: You will find this amber brick in “Level 18: Out Of Bounds” of Jurassic World on Isla Nublar. Which is the left island on the map; you enter the correct area by selecting the blue Jurassic icon. – Play it in Free Play. Travel to the “Indominus Escape” section of Level 18. Cheat Code: The code to enter to get this Amber Brick’s dinosaur is “GAAAAC” (on 3DS) & “GAAAAAA” (on PS Vita). Where exactly to find the Indominus Rex Amber Brick: It’s shown in this video guide with handy directions that lead to the amber brick. Description: This nineteenth Amber Brick contains “Dimorphodon” DNA. Location: You will find this amber brick in “Level 19: Under Attack” of Jurassic World on Isla Nublar. Which is the left island on the map; you enter the correct area by selecting the blue Jurassic icon. Travel to the “Main Street” section of Level 19. Where exactly to find the Dimorphodon Amber Brick: It’s shown in this video guide with directions that lead to the amber brick. Description: This twentieth Amber Brick contains “Mosasaurus” DNA. Location: You will find this amber brick in “Level 20: Main Street Showdown” of Jurassic World on Isla Nublar. Which is the left island on the map; you enter the correct area by selecting the blue Jurassic icon. – Play it in Free Play. Travel to the “Innovation Center” section of Level 20. Where exactly to find the Mosasaurus Amber Brick: It’s shown in this video guide with voice-over directions that lead to the amber brick. Huge thanks to TT Games, Rasmus, Trophygamers, Packattack, NextGenWalkthroughs, GamingSpite, ShockblastMedia’s Jay, JJ1996, BaxiGrace & GrannieO for the guide videos and tips. Please comment if you have any additional Lego Jurassic World Amber Bricks location tips of your own, please post them below. – Thanks for visiting!